A good golfer needs a good golf swing. 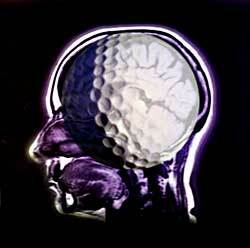 A great golfer needs a strong mind. There are many who are able to swing and hit the ball like Tiger Woods, Ernie Els or Phil Mickelson, but when it comes down to winning golf tournaments, what counts is how mentally strong and gutsy they are. Over my amateur and professional golf career, my experienced is that often golfers get on the first tee with lots of hope for a good round. If they happen to start badly, then within the first few holes they get into a totally negative mind set. The result: a disastrous score. Let's try and find ways to avoid this happening to you. Do not let your performance over the first four or five holes determine how you are going to think. It basically comes down to: "Are you going to let your mind control the golf ball, or your golf ball control your mind?" It is imperative that from the start you set your mind on how you are going to approach your round, and not allow yourself to change that, whether you get off to a good start or not. It is common for golfers to approach the first tee with hope, and if things don't go perfectly, to all of a sudden start beating themselves up, getting lost in self pity. They play the next couple of holes badly, forecast further gloom and doom and then simply give up. It is very important to think positively throughout the round. Sometimes birdies come in the first few holes, and other times the birdies fall in the last holes. Never give up until you are done. Keep up the fighting spirit until the very last hole. Q: A is playing a match against B. A hooked a drive into a hazard, and the ball was playable. A had to walk a long ways into the hazard to play the ball, and to save time, A took three clubs along with him to have a choice as to the right one to use. A chose his club and leaned the other two clubs against a tree in the hazard. B saw this and wanted to penalize A for grounding the club in the hazard. Is B right? A: Rule 13-4 covers the situation of the player's ball in the hazard. If you will note exception 1-b, you will see that provided nothing is done that constitutes testing the condition of the hazard or improving the lie of the ball, then there is no penalty if A places extra clubs in the hazard. Even if A had rested all three clubs against the tree before playing the shot or even used one like a cane to keep from falling when entering the hazard, there is no penalty provided he didn't test the condition or improve his lie. But remember, under decision 13/4-2, you can't lean on your clubs while waiting to play a shot from the hazard - that is two stroke penalty in stroke play or loss of hole in match play.